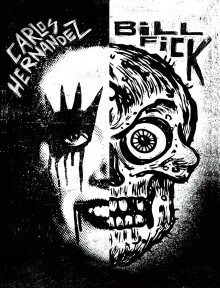 Speedball Road Show with Printmakers Bill Fick and Carlos Hernandez is coming to Wet Paint! They’ll be holding court in our classroom on Friday night and Saturday during the day. Expect a weekend full of valuable information and inspiring images. Friday you’ll see a relief printmaking demo featuring the new professional relief inks and the new small bed etching press from Speedball. On Saturday, it’ll be screen-printing in action! This dynamic duo brings to life the beauty and mastery of relief and screen printing. Each printmaking process is creatively demonstrated to provide both education and excitement. Whether new to printmaking or a skilled professional, their demo will leave a lasting impression. All products and inks generously donated by Speedball.